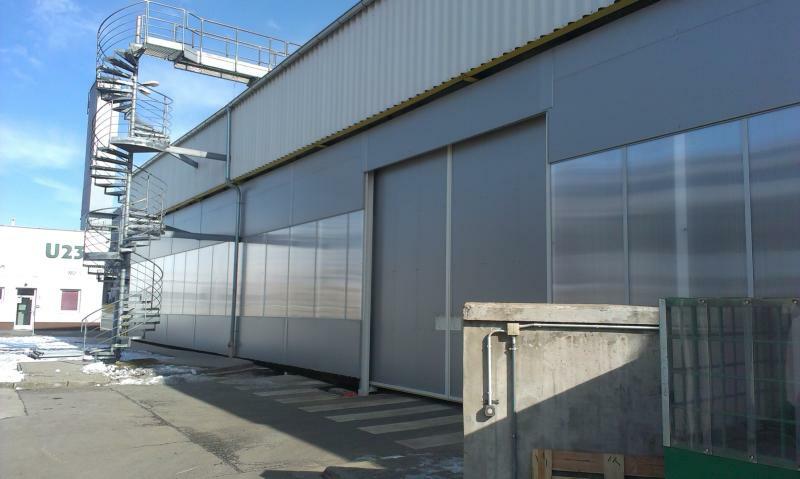 The wall encloses the attached roof, where several noise sources are located, because of the doors leading directly into the welding shop and to the space where transport vehicles are located. The wall consists of perforated Isolamin PA33CL502 panels with a surface finish suitable for outdoor environments. The perforation is directed towards the welding shop. The panels are attached to a steel structure. The wall is fitted with a large gate 5.2 x 4.5 m, made from Isolamin panels on a special mobile structure. The entire length of the wall is divided by a band of polycarbonate chamber panels with improved soundproofing features.